The unit can be customized as per your request. The upholstery fabric can be changed as per your need. Are you looking something royal for your home? You have come to the right place. Aarsun Woods give you a wide range of designs and finishes in wooden furniture. 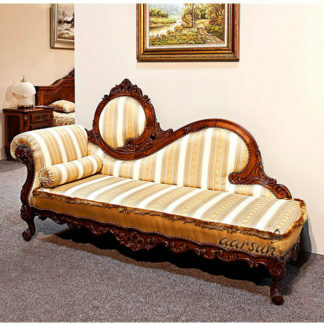 The craftsmanship of Aarsun Woods lies in the combination of art and traditional carving. We have a range of designs that can blend in modern as well as traditional homes. 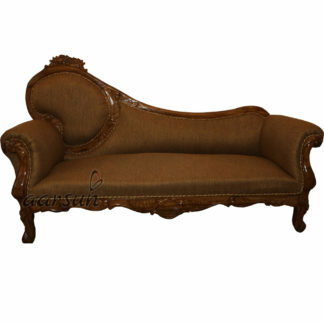 Wooden Deewan gives a sophisticated look to your living area and can also be placed in your bedroom. This particular deewan is made from premium quality Solid Wood with layered Gold finishing that gives it a royal look. The elegant curves and the leatherette upholstery can enhance the look of almost any type of interiors. The minor floral carving and linear stretches makes this unit a powerful symbol of excellent craftsmanship.